For the cannoli fillings, I had a chocolate mousse filling and a more traditional sweet ricotta filling available (recipes to follow below). 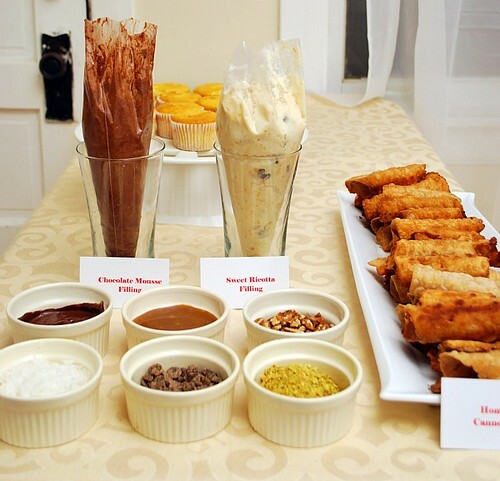 But by far, the most time consuming task in preparing this cannoli bar was making the homemade cannoli shells. I had a few recipes to draw from but ultimately decided on one from a fellow blogger that hosted the Daring Bakers challenge. The dough wasn't too difficult to make and I especially liked the subtle flavor of chocolate and cinnamon. The wine also came through but more as a faint aroma than an actual flavor in the dough. Nonetheless, it was definitely a winner for me. After testing out the recipe a few times before my party, I'm pretty confident about making this and even came up with some shortcut tips! The original recipe for the dough calls for rolling it out thin and using a large cookie cutter. I found when I followed these steps I ended up with a lot of scraps that really couldn't be worked into a dough to use again. So instead of rolling out and using a cookie cutter, I just portioned out the dough into the number of cannoli I want to make... and then roll each portion into a ball. 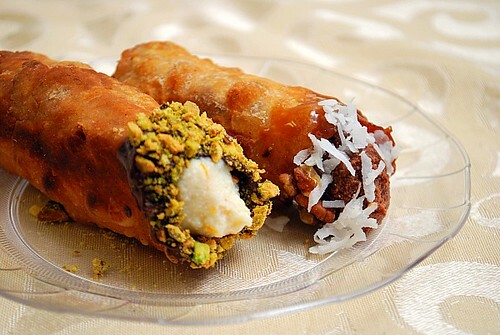 This ball is then rolled out into a very thin oval shape that I roll using the cannoli tube. Doing it this way eliminated the amount of waste and the step of rolling out and using a cookie cutter. In the bowl of a stand mixer fitted with the paddle attachment, combine the flour, sugar, cocoa, cinnamon, and salt. Combine the oil, vinegar, and enough of the wine in a 1 cup measuring cup and slowly pour into the stand mixer bowl to make a soft dough. Remove the paddle attachment and replace with the dough hook attachment. Continue kneading dough in the stand mixer kneading until smooth and well blended, about 2-4 minutes. Remove the dough from the bowl of the stand mixer and shape the dough into a ball. Cover with plastic wrap and let rest in the fridge from 2 hours to overnight. Allow the dough to come to room temperature. Cut the dough into two pieces. Keep the remaining dough covered while you work. 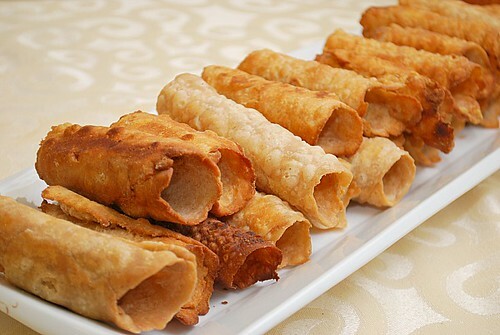 Lightly flour a large cutting or pastry board and divide the dough into 6 equal portions. Roll each portion into a ball in your hands and using a rolling pin, roll the dough until super thin, about 1/16 to 1/8” thick. Roll the dough into an oval, rolling it larger and thinner if it’s shrunk a little. Oil the outside of the cannoli tubes. Roll a dough oval from the long side around each tube/form and dab a little egg wash on the dough where the edges overlap. Press well to seal. Set aside to let the egg wash seal dry a little. In medium saucepan, combine egg yolks and milk. Heat over low heat, stirring constantly, until mixture is almost boiling and is thickened enough to coat spoon. Remove from heat. Stir in chocolate chips, vanilla and liqueur; continue stirring until chocolate is melted. Cool to room temperature, stirring occasionally. Beat egg whites until stiff; fold gently into the chocolate mixture. Fold in whipped cream. Refrigerate until ready to use. Place ricotta in wet cheesecloth and wring out as much moisture as possible. If needed, strain overnight to remove excess liquid. Combined strained ricotta with remaining ingredients. Cover and chill for at least 2-3 hours or overnight for flavors to meld.